A fingerprint was a key to tracking down the man who allegedly mass-mailed explosive devices to top Democrats, CNN and other prominent figures, according to the FBI. Suspect Cesar Sayoc, 56, of Aventura, Florida, was taken into custody Friday, authorities said. Days after the first package was delivered, FBI investigators found a latent fingerprint from an envelope mailed to Democratic California Congresswoman Maxine Waters. The fingerprint belonged to Sayoc, FBI Director Chris Wray said at a news conference Friday. 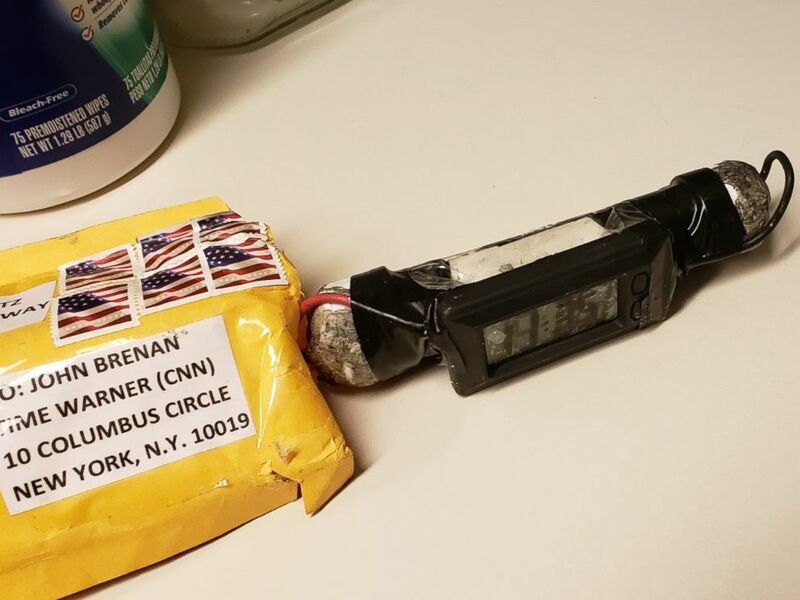 "There is also a possible DNA connection between samples collected from pieces of two different IEDs [improvised explosive devices] mailed in separate envelopes and a sample previously collected from Sayoc in connection with an earlier arrest down in Florida," Wray said. Once Sayoc's identity was established, cell phone tracking was used to find him, according to law enforcement officials briefed on the investigation. Sayoc was arrested about 10:30 a.m. at an AutoZone store, two law enforcement officials said. 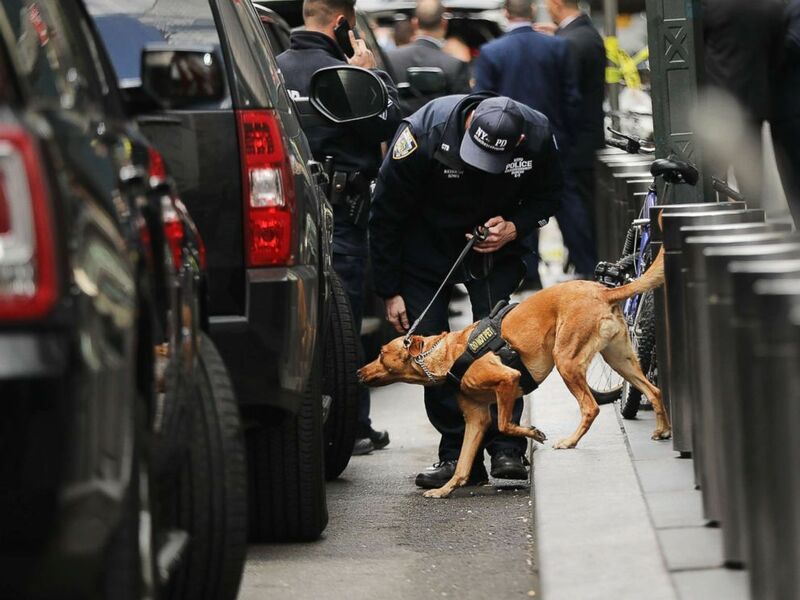 Wray praised investigators' quick efforts to find the suspected bomber, calling it "phenomenal work with the greatest pressure under an incredibly tight timeframe." "We see unbelievable work like this on TV and in Hollywood, but to see it up close, in reality, is something to behold, and we are so proud for our team at the lab for their work in keeping people safe and helping to find the individual responsible," he added. 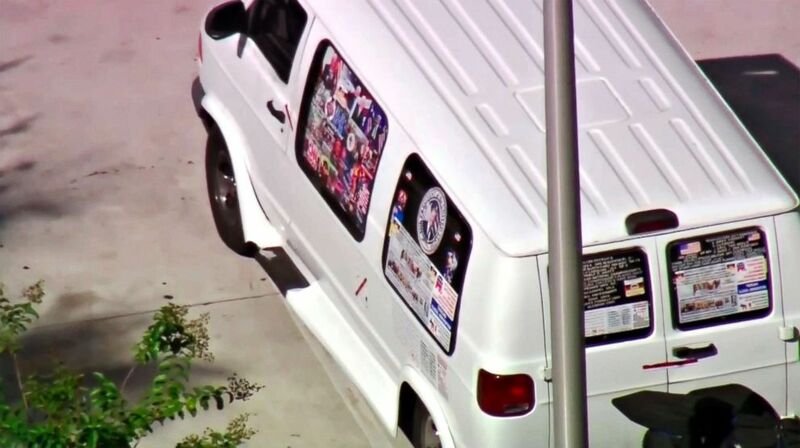 This frame grab from video provided by WPLG-TV shows a van parked in Plantation, Fla., Oct. 26, 2018, that authorities have been examining in connection with package bombs that sent to high-profile critics of President Donald Trump. 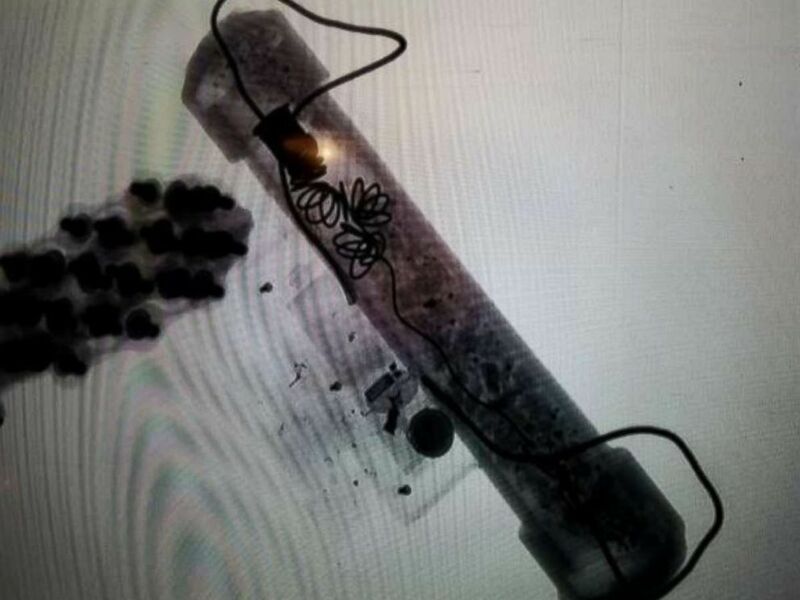 Each improvised explosive device was made out of about 6 inches of PVC pipe, a small clock, a battery, wiring "and what is known as energetic material, which is essentially potential explosives and material that give off heat and energy through a reaction to heat, shock or friction," Wray said. "These are not hoax devices," he stressed. 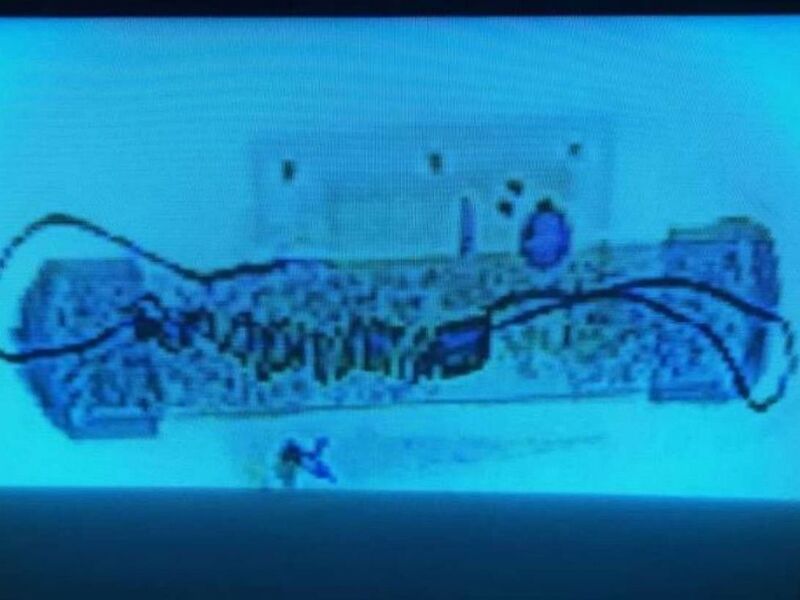 An x-ray of the explosive device recovered at Time Warner Center in New York on Oct. 24, 2018. Sayoc made no formal statement upon his arrest and gave no information to authorities regarding how many more packages might exist, said law enforcement officials briefed on the investigation. Sayoc is charged with five federal crimes including interstate transportation of an explosive, illegal mailing of explosives and threats against former presidents, Attorney General Jeff Sessions said. Sayoc faces up to 48 years in prison. The charges may change, Sessions said at a news conference Friday afternoon. 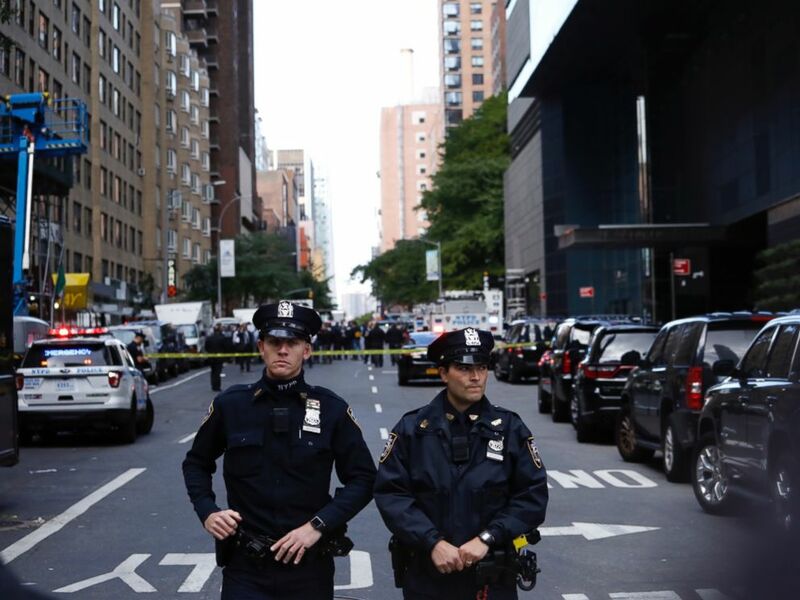 Police stand guard in a closed street after a bomb alert at the Time Warner offices in New York, Oct. 24, 2018. 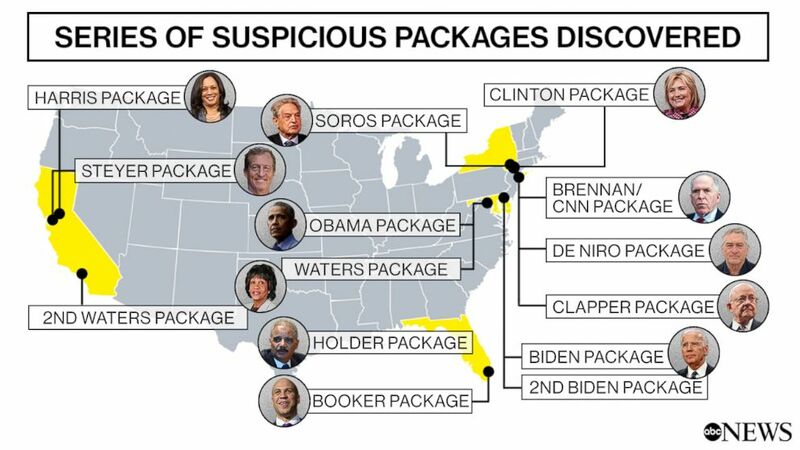 Authorities have recovered at least 14 suspicious packages in the widening investigation, with some of the latest targets being Democratic Sen. Kamala Harris of California, Democratic Sen. Cory Booker of New Jersey, former Director of National Intelligence James Clapper and billionaire philanthropist and liberal donor Tom Steyer. Former President Barack Obama, former Vice President Joe Biden and former Secretary of State and presidential candidate Hillary Clinton are also among those targeted. President Donald Trump said the suspect will be prosecuted "to the fullest extent of the law." "These terrorizing acts are despicable and have no place in our country," he said from the White House Friday. "We must never allow political violence to take root in America." Sayoc has a long history of criminal charges, with at least eight arrests in Florida, including grand theft auto. In 2002 he was arrested for threatening to discharge a destructive device, according to court documents. 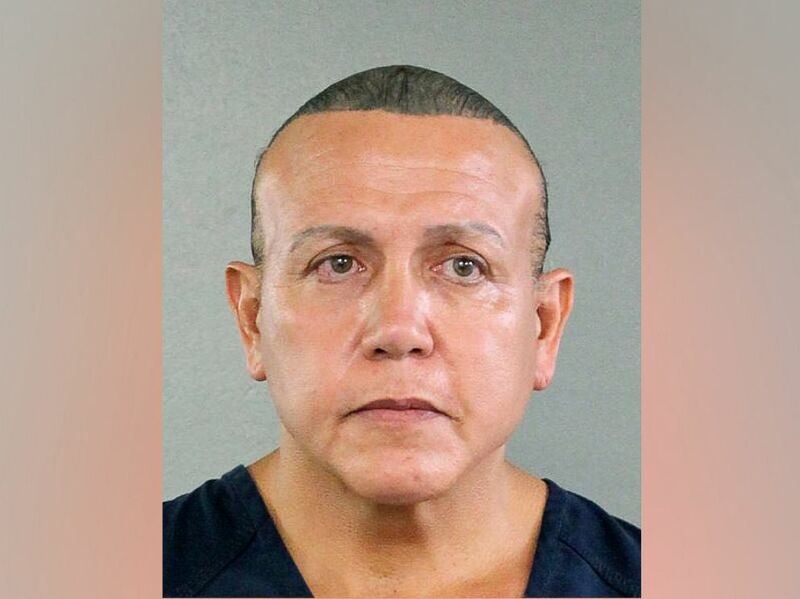 Sayoc called Florida Power & Light and threatened to blow it up, saying "it would be worse than September 11th," according to the arrest record. He "also threatened that something would happen to the FPL representative if they cut his electricity," the record said. He pleaded guilty in that case and was sentenced to probation.